Major signing experience enhancements focused on usability across large and small screens, updated and modernized user interface elements, eliminating redundant clicks and screens, and overall improving the signing experience. We will be rolling this update out slowly to ensure the best adoption and also to catch hidden issues we might have missed during testing. Want to get the new signing experience right away? Fill out the form to the right, and we'll add you to the priority list! Clean, modern look and feel. We’ve completely revised the color scheme and layout to eliminate clutter and present a next-gen signature experience. At the same time, we’ve retained enough of the previous experience so as not to confuse existing users. View and sign on any and all screens. Using what’s known as a ‘responsive design framework,’ the signing experience now automatically reconfigures itself so signers can easily sign documents whether they're using a 27” computer display, a tablet or a 4” screen on a mobile phone. Personalized and simplified dialogs. 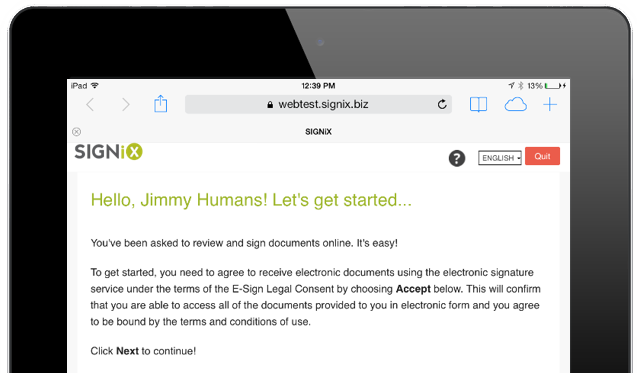 The signer’s name is included in dialog boxes, as well as much clearer, non-technical explanations of what the signer needs to do throughout the signing process. We’ve also reduced the amount of clicks required to complete common actions. View and sign all documents at once. Rather than forcing the signer through separate documents and contexts, all documents to be signed by the signer are presented together and can be scrolled through completely. SIGNiX will still keep PDFs separate when downloaded, but the documents are viewed and presented together. Also, based on user feedback, we have eliminated the ‘Document List’ screen to speed the signer into the review and signing process. Completion process substantially improved. 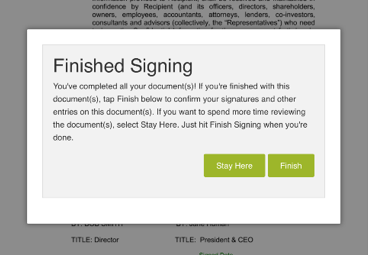 Signers are now clearly notified when they have completed all of their signatures / tasks and can easily confirm their signatures and finish signing. Easily download / print all documents upon completion. No need to go through an intervening document list screen. Updated term “Signing PIN” to “Signing Password.” Requested by many users! All signatures are now rendered and viewable as entered by the signer. 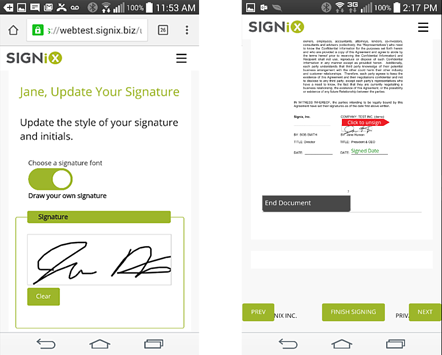 Previously, depending on certain settings, some lower authenticated signatures would render as italicized text in the document view until the signing process was finished. Now, those signatures render correctly. Returning signers can update their signature. Previously, signers were not provided an easy way to change their registered signature appearance. Now with a simple check of a box, they can update their signature, easily and quickly. Progress, Next / Previous signature controls improved. Previously, the interface relied more on text and hard to find buttons. Now, you can easily see your progress with a simple graphic, and navigate back and forth to your signatures and other fields with obvious NEXT and PREV buttons. Group Signature instructions. When a signer attempts to sign a signature that’s part of a group of signatures (for example, sign here if you agree or below if you disagree), he or she is presented with text to better inform her of her action. Tag Recycling™. Easily replace tagged documents without time-consuming retagging. Simply hit the recycle button, and choose a new document. Signatures and other tags stay in the same place, but the underlying document is replaced. Tags. Now submitters can easily tag their transactions and templates to aid in searches and filtering. Transaction Filtering. Easily filter transactions to find what you’re looking for, fast. Filter for completed, expired, in progress and other statuses to drill down to the transaction you need. Party name field. Now simply check a box to auto-fill a party’s name to any dragged and dropped text field. Cleaner icons in Add Party and Add Document tabs. Simplifying the user experience in the Wizard in preparation for moving to an updated interface later this year. Better user handling of expired links. Submitter will be notified via email if a signer attempts to access an expired signing link.